The properties of materials depend on the physical size of the material specimens themselves. Typically, the size of the material when this dependence becomes evident is quite small, on the order of a few microns or less. This dependence of properties on size is the main phenomenon that focused attention on the materials aspects of Nanoscience and Technology. One of the earliest known examples is the dependence of theoretical shear stress of a metal on size, known from research by S.S. Brenner, who showed that the tensile strength of ductile metals (i.e. deformation in shear) would only approach theoretical values when the metal specimens were very small cylindrical crystals. These were called whiskers (for obvious reasons!) and contained no lattice defects. The critical whisker dimension is its diameter. It was found that whiskers smaller than a few microns had a low probability for the presence of lattice defects, and many were perfect crystals. The strength of these perfect crystal whiskers closely approached theoretical expectations. Subsequent microscopic measurements showed that the lattice defect concentration in whiskers was an increasing function of whisker size, and that whiskers containing defects were much weaker. New research on this topic using atomic force scanning probe microscopy showed that gold nanowires were up to 100 times stronger than large bulk gold objects. This confirmed the nanosize effects on strength. 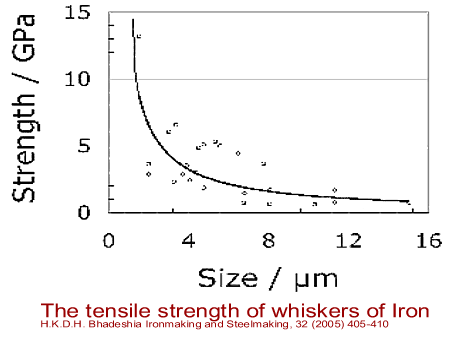 The size dependence of strength of iron whiskers is seen in the graph below. The discovery of carbon Buckminster Fullerenes by mass spectroscopy and carbon nanotubes by high resolution electron microscopy have captivated popular imagination. The properties of these tiny nanomaterials such as electrical resistivity, electronic bandgap and mechanical strength, differ markedly from bulk diamond and graphite because their nano-scale structures are different even though they are composed of the same carbon atoms. Carbon nanotubes, with their fascinating five- and six-member thin wall ring structures, have become the signature materials of the nanoscience and technology era. 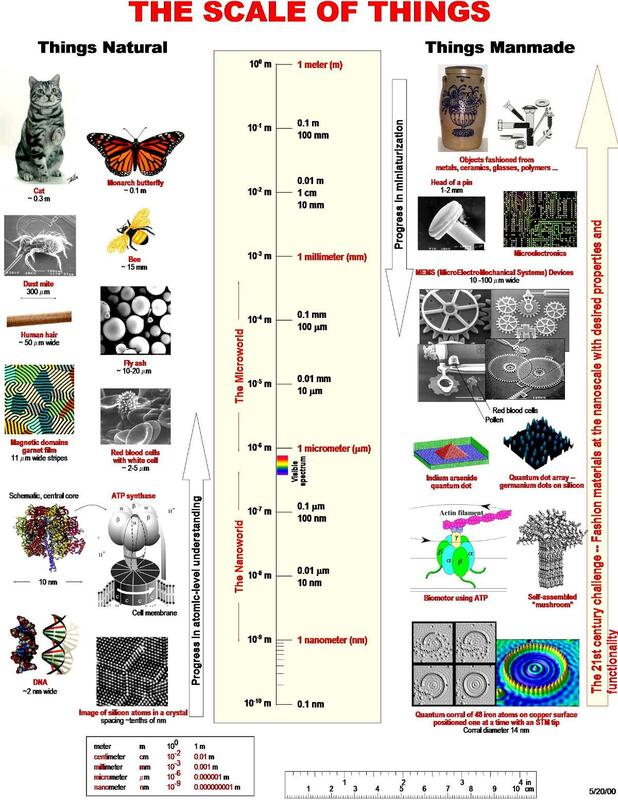 Examples of the growth and structure of these and other fascinating nanomaterials are given in the Projects and Gallery sections of our website. The tiny size of objects in the nanoworld is unfamiliar at first to most young students. Overcoming this abstract barrier to understanding is key to visualization of objects and processes in this important new era. The SCALE-OF-THINGS diagram (click on the picture) shows that one micron is at the dividing line between size ranges called the Microworld and the Nanoworld. One micron (more formally one micrometer- equal to one-millionth of a meter) is approximately the limit of resolution of an optical (visible light) microscope. For perspective, the finest human hair is about 15 microns in diameter. The resolution limit of unaided human eyes is even larger, about 0.1 mm. 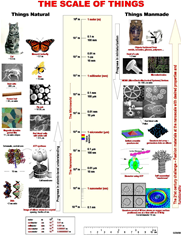 The position of these limits on the scale illustrates the abstract nature of Nanoscience and Technology. Visualization and intuitive understanding of materials and processes in this realm requires additional microscopy techniques, with more magnification and higher resolution, such electron, scanning probe, x-ray microscopy, and extensive computer modeling that will lead to correct interpretation of results. We are presenting a continuing series of results here on this web page, that show in-situ synthesis and high resolution experimental results for several nanomaterials of current technological importance, to illustrate visualization at the Nanoworld for undergraduates, particularly. Our resolution and magnification limits extend below the formal Nanoworld lower limit to 0.1 nm, and soon to below that. The 0.1 nm limit corresponds to another naturally occurring unit of length of length called 1 Angstrom. It is particularly useful to keep the magnitude of 1 Angstrom in mind (i.e. 0.1 nm) when traveling in the Nanoworld, because it approximately equal to size of most atoms, and smaller, or shorter, lengths are in the subatomic range.